George Halas with interpreter Liz Scully at the 2017 Summer Deaflympics in Turkey. 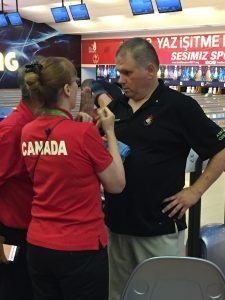 It will be George Halas’s first participation at the Canada Deaf Games as a bowler, and he wants to be on the podium either in the singles or master event, or both! The Ontarian began his international career in 2003 at the World Deaf Bowling Championships in Taiwan where he won the bronze medal in the masters event. Two years later he wins another bronze medal this time in the singles event at the 2005 Summer Deaflympics in Australia. For Halas it is not different to compete at the Canada Deaf Games or internationally as the goal remains the same: win medals. Halas would like to see all bowlers do their best at the Games and compare the reference with international events. Once the games are over, Halas will analyze his performance and that of his competitors to improve for future competitions. “I want to be the best, so that young bowlers can be inspired by my performance and excel at the national and international level,” said Halas. Halas encourages any young bowler to practice a lot and participate in as many tournaments as possible to learn to compete in different environments. He also recommends to bowl with all kinds of bowling balls in order to feel confident with every ball in a tournament. Bowling events will be held between Thursday, Feb. 22 and Saturday, Feb. 24. Consult the schedule of the Canada Deaf Games.